A "pig launcher" at the Eighty-Eight Oil tank farm in Guernsey, Wyoming. The pipeline tool known as a pig is versatile. In the 1971 James Bond film Diamonds Are Forever, Bond used a pig to blow up a pipeline. In the 1987 Bond film The Living Daylights, defecting Soviet spy Georgi Koskov used a pig as an escape route. In the 1999 James Bond film The World Is Not Enough, a pig was used to smuggle a nuclear weapon. But pigs aren’t just excellent plot devices — they also have practical applications. 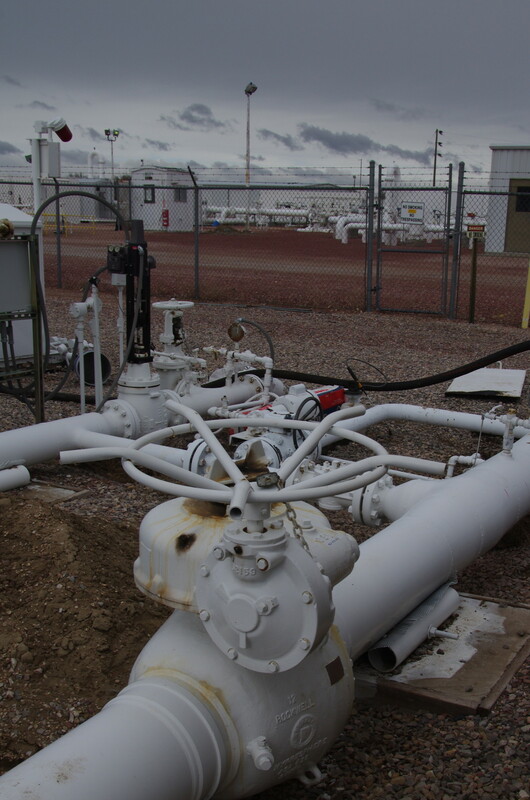 They’re used for cleaning pipelines, pipelines that carry natural gas, crude oil, waste water from energy producing areas to the places where that energy is used. 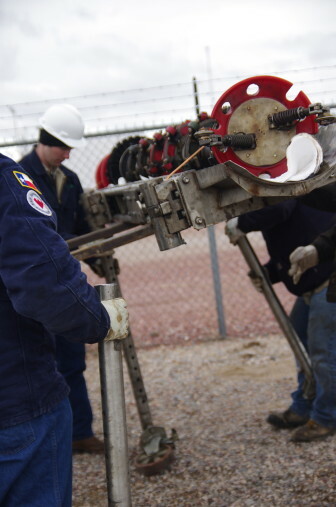 Perhaps more importantly, they are used to inspect the millions of miles of pipeline that crisscross the country for corrosion and other problems. That’s what engineer Sean King was using a pig for on a blustery March morning at the True Company tank farm just outside of Guernsey, Wyoming. A \”pig launcher\” at the Eighty-Eight Oil tank farm in Guernsey, Wyoming. The project for the day was to pig a 12-mile section of the Belle Fourche pipeline, between Guernsey and Ft. Laramie. Although there was nothing obviously wrong with the 40-something-year-old pipeline, but King explained it was due for its federally mandated 5-year check-up. “We have the National Historic Site with Ft. Laramie and we have the river in Ft. Laramie, so you can only imagine what would happen if there was a problem,” he trailed off. Of the country’s 2.6 million of pipelines, only those in areas deemed ‘high consequence,’ get pigged on a regular basis. That ends up being less than half of hazardous liquids pipelines and less than ten percent of natural gas lines. A smart pig in Ft. Laramie, Wyoming. But Carl Weimer, with the Pipeline Safety Trust, an industry watchdog group, says pigging lines is only helpful to a point. “It’s a pretty good technology, but it’s very dependent on the company using it correctly,” he said. And pipeline companies have a lot of latitude in how they use pigs. The federal agency which regulates pipeline safety, the Pipeline and Hazardous Materials Safety Administration, declined repeated interview requests for this story. But as Weimer explains, the agency mostly leaves things up to the companies. Inspectors also review the pigging data and occasionally do site visits. But with 2.6 million miles of pipelines in the ground and a combined total of just about 500 state and federal inspectors, safety advocates like Weimer worry problems might be slipping through the cracks — especially as companies race to build new pipelines to build new pipelines to handle booming domestic oil production. One pipeline executive at a recent industry conference pointed out that producers have their foot on the gas pedal, and are counting on “midstream” companies to lay the track in front of the train. It’s that kind of metaphor that Weimer worries about. They found shoddy welding, poor quality pipe and inadequate coating, to name a few things. Those are problems that Sean King, the engineer, is hoping not to find on the decades-old Belle Fourche pipeline. But the pig probably will find some corrosion or other problems in the millions of data points it collects, and those problems will need to be acted on. King says they’ll probably end up digging up and repairing half a dozen sections of pipeline based on the testing, but he acknowledges there are limitations to any test. And what happens when those problems aren’t found? “I don’t think there’s ever been a pipeline company out there that’s never dropped a drop of oil on the ground, it’s kind of inevitable,” he said. With half a million miles of new pipeline planned for the next two decades, those spills are only likely to increase. Millions of miles of pipeline are slated to be built in the United States over the next two decades and most that will happen on private property. Historically, property owners haven’t benefited from pipeline construction, but that’s changing.